Bingata, a colorful traditional cloth that dates back to the Ryukyu Kingdom’s 14th century, is one of Okinawa’s most recognizable forms of art in the form of water, flowers and fish. One of Okinawa’s top bingata designers is unveiling new design creations Monday at a Glorious Bingata Exhibition at Okinawa Market Place in the Camp Foster Concession Mall. Sachiko Yafuso, who’s dedicated her life to promoting the preservation and increased wear of bingata fabric products, has traveled to mainland Japan and China over the past 20 years telling the bingata story. 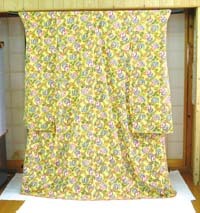 The stencil-dyed fabric was first created by Okinawan artisans who drew upon Indian, Chinese and Javanese dye processes. It gained status following Japan’s 1609 invasion of the Ryukyu Kingdom and Okinawans were forced to make not only bingata, but banana fiber jofu and kafu fabrics. The 61-year-old Yafuso, who has not only a bingata factory but also Issen Bingata School, is involved in teaching and promoting Okinawa traditional hand crafts, including operating a dyeing material shop. She also teaches bingata in Wakasa Public Hall, the Well Culture Center and in Okinawa City. Her office shelves and bookcases are lined with traditional hand craft artist awards, including prizes from the Minister of the Economy, Trade and Industry. The devastation of the Battle of Okinawa in 1945 wiped out many bingata shops and stencils, but artisans led by Eiki Shiroma went to mainland Japan and recovered bingata stencils taken by collectors and Japanese soldiers. The art flourished, and Sachiko Yafuso, who was born in Naha City’s Ameku district, became enamored with the colorful art as a child. Yafuso’s exhibition is featuring a variety of bingata products, including tapestries, table clothes, bags, ornaments and kariyushi wear. She’ll be showing how the bingata process takes place, and how she makes bingata products. The Glorious Bingata Exhibition runs March 2nd ~ 15th at Okinawa Market Place in the Camp Foster Concession Mall, Building 1002.